Baked Tilapia is a very affordable dish and it can be ready within 30 minutes, of which just 10 minutes are used for preparation. The rest of the time the tilapia recipe is cooking in the oven. This recipe requires 4 – 4 ounce tilapia fillets and is enough for 4 servings. Note! This recipe is not only suitable for making baked tilapia; you can use it to prepare almost any type of baked fish fillets as long as the fish is mild in flavour and firm-fleshed. Start by preheating the oven to 175°C/350°F. Prepare a medium sized baking dish by coating its bottom with a few tablespoons of the olive oil. Pour the rest of the olive oil into a small bowl and mix it with the salt, pepper, oregano, garlic and tomato paste. Place the tilapia fillets in the baking dish. The skin side should be up. Use a spatula to gently spread the mix from the bowl over the fillets. A large part of the paste should be used to cover the centers of the fillets. Slice one green bell pepper into thin slices. Slice one large onion into slices. 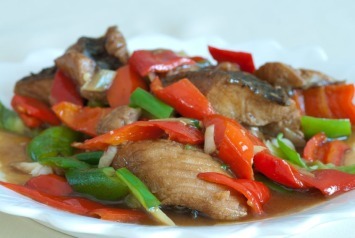 Place the green bell pepper and the onion around the tilapia fillets. Place the baking dish in the oven and bake for 15 minutes. The baked tilapia is finished when you can easily flake it using a fork. Remove the tilapia from the oven and place 1 tablespoon of butter on top of each fillet. Set the oven to broil and broil the tilapia for 5-7 minutes. The butter should be fully melted and just turning slightly brown when you remove the dish from the oven. As it says above, feel free to replace the tilapia fillets with a mild flavored white fish of your choice. Cod or haddock would be great too. The recipe states to use green bell peppers, but I love the look of multi colored peppers, so I would do 1/2 green pepper and 1/2 red pepper. Or color it up even more with multicolored peppers. This recipe for baked fish is a perfect diabetic recipe but also suits low carb diets and gluten free recipes. Like this recipe? I’d love you to Pin it to Pinterest, Tweet about it, Like it on Facebook and leave a comment and your won favorite recipes below. If you like this baked tilapia recipe, browse our other fish and seafood recipes here.